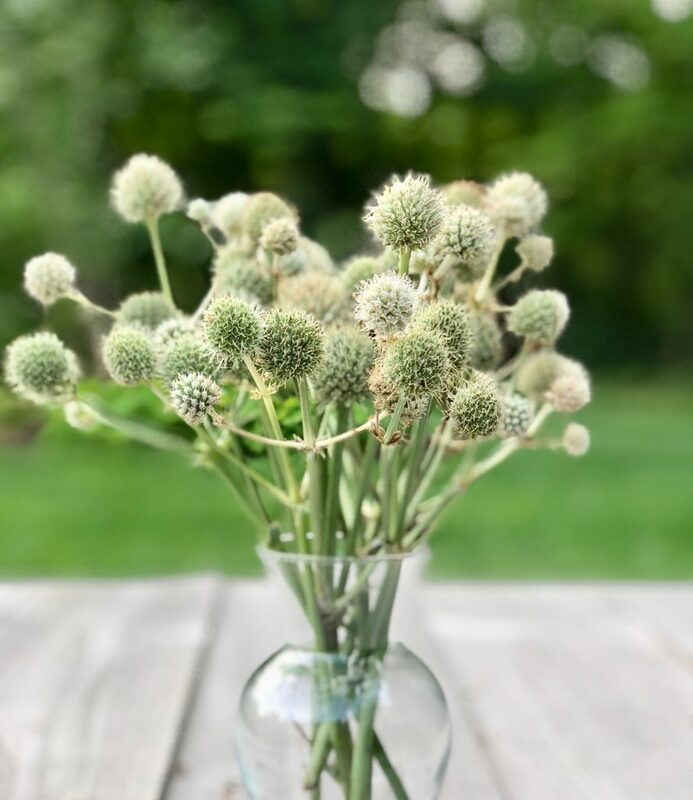 Often, when I go out into the garden I can quickly find blooms to cut and create an arrangement of that exact moment in the season. The other weekend when faced with the need for a large amount of blooms to decorate a table, the gardens seemed lacking blooms. We needed to get creative and look at items past their peak. One week past the party, the past peak blooms have held their beauty well after the other peak blooms have faded, dropped petals, and wilted. 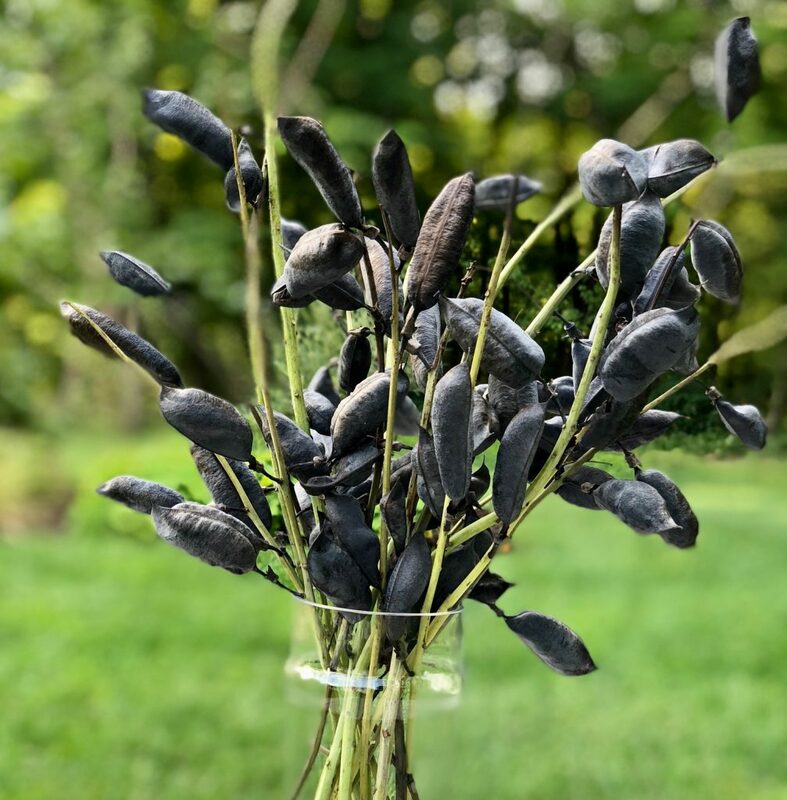 Baptisia australis seed pods. During the spring, Baptisia australis blooms a soft blue lupine-like flowers, which by July are long gone. However, the dark seed pods persist . The pods give a wonderful rattling anytime we move the vase around. Our plant has been in the ground for a few years, and I think I was able to pull about 25% of the seedpods. This was also the 2010 Perennial Plant Association (PPA) perennial plant of the year. 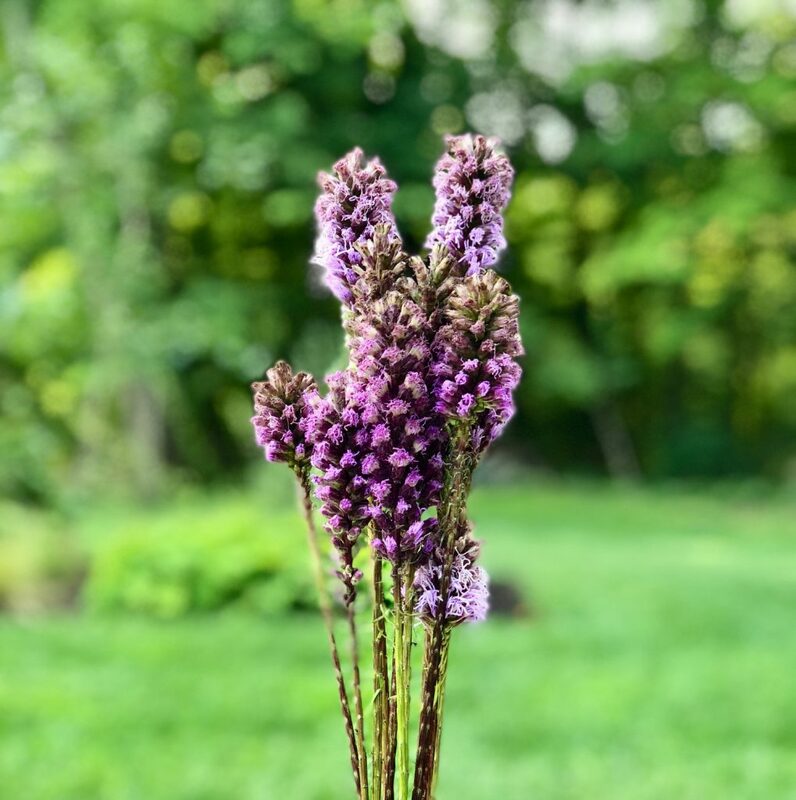 You can order plants from Bluestone Perennials Inc.
Liatris spicata. In the garden this perennial is at its peak during July and August so was one of the first blooms that we cut off plants in the nursery. However, these are the blooms were cut 8 days ago and still look absolutely beautiful. The green leaves down the stem have been removed, but other than that these look exactly the same as the day they were cut. You can order this perennial from American Meadows. Allium sphaerocephalon or ‘Drumstick’ Our drumstick alliums were at their peak during June and are slowly fading. However, the beauty of alliums is their the transition of the bloom and continued architectural structure they provide to the garden after their peak. The floppy flowers combined with their stick straight stems might make these my favorite of the post peak bunch. I highly recommend planting these by the handfuls come this fall. 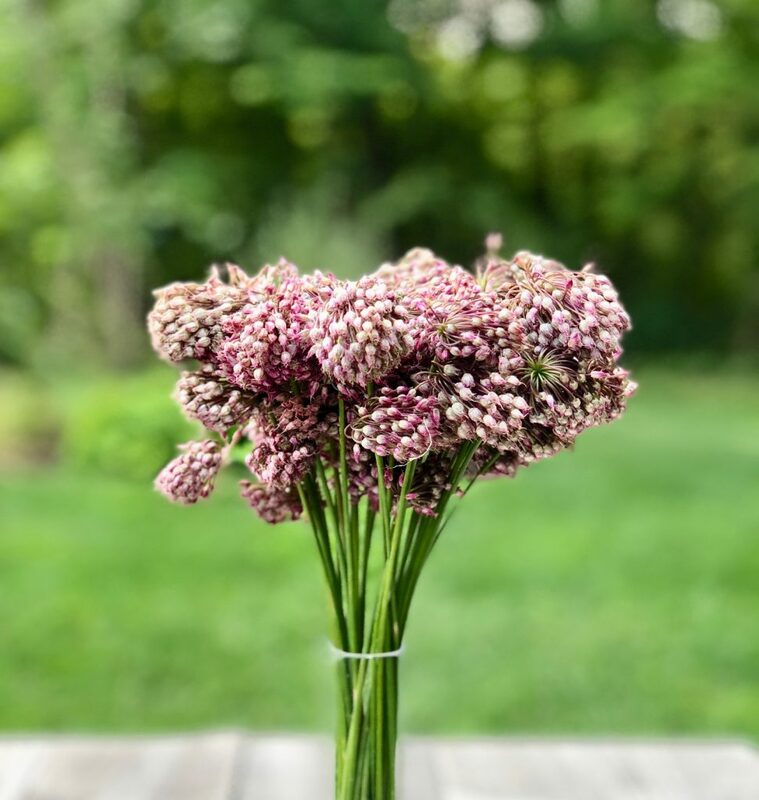 Unlike other larger allium these are cheap, so you can plant by the hundreds. It also helps they are roughly the size of a dime! You can order from Longfield Gardens. Stachys byzantia Common name lambs’ ear. The first round of cutting focused on trimming of the soft silver leaves of the lambs’ ears, often the highlight of this perennial ground cover. 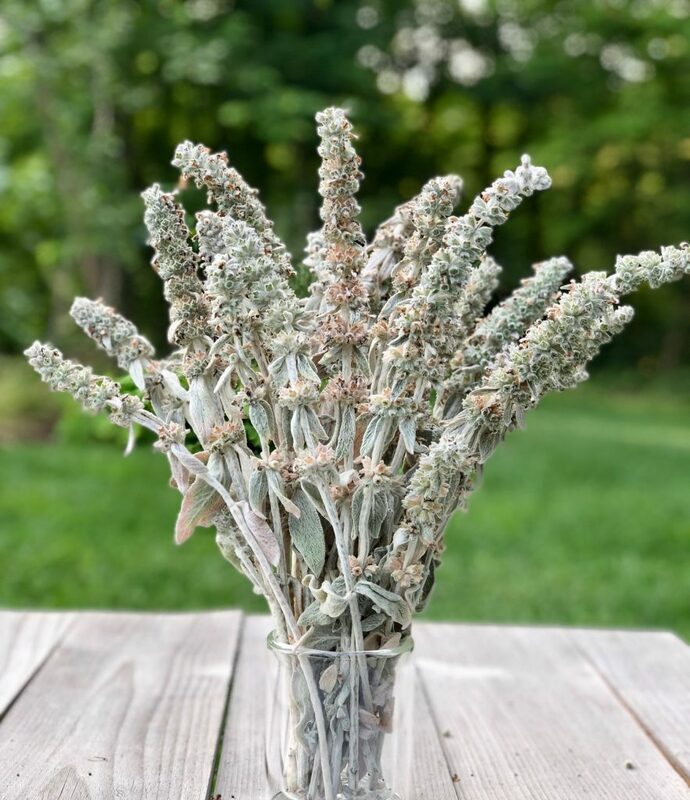 It was the need for more blooms that got us to go back and trim up the dried flower stalks. Normally these flowers are cut from the plant with the silvery foliage being the most desired feature. Thank goodness for delayed maintenance because despite drying and tints of brown, these flowers still provide a great softness. with the other past peak blooms. This exercise was a great experience in looking at things with out preconceived ideas on what is beautiful and even if not a plants or flowers peak. We are enjoying this arrangement long after the florist flowers have gone to mush. 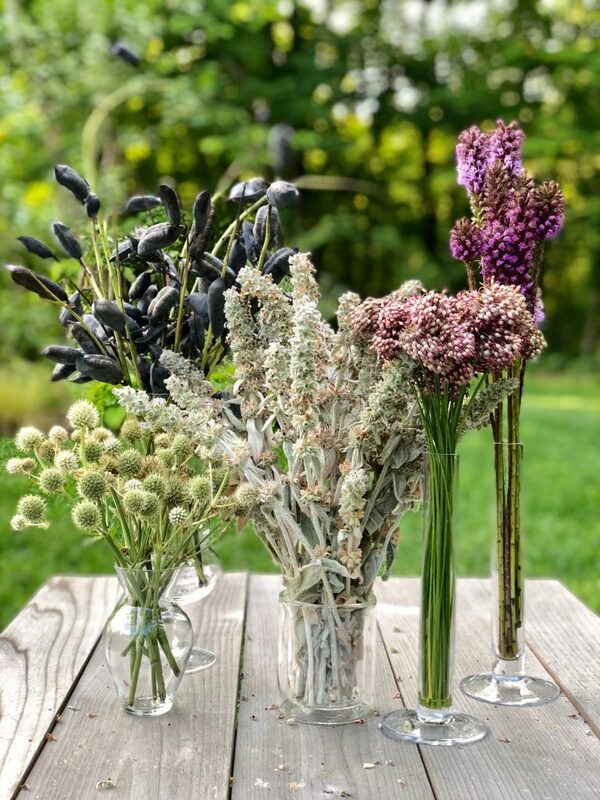 This entry was posted in Arrangement of the Week, Bulbs, G A R D E N S, Perennials, Plants, Uncategorized and tagged Allium sphaerocephalon, Baptisia australis, central ohio, Columbus, Eryngium yuccifolium, garden design, garden inspiration, gardening, gardens, landscape design, Liatris spicata, perennials, Plant Combos, rattlesnake master, Stachys byzantia, What's in Bloom by Nick. Bookmark the permalink.